Update Your Kitchen with Kuhn Rikon and Frieling Kitchen Products! Looking to re-vamp your kitchen, need a great wedding gift, or just need to re-stock your kitchen utensils and cookware? Then let me help you with some great kitchen products from Kuhn Rikon and Frieling! This award-winning Heart Spring hinges flat to reach pan corners – perfect for gravies, sauces, custards, and more. I love using this whisk and I use it all the time - with eggs, pancakes, cake mixes and so much more! I love the unique heart shape and how it gets in the corners! This flexible stainless steel spatula features a thin-angled edge that slips gently under delicate foods to turn and serve them. I am trying to eliminate all plastic kitchen utensils and cookware from my collection so I love this stainless steel spatula! The slim spine and long slots allow for quick, efficient draining and the thin leading edge is angled and offset, so the spatula can slip easily under foods. 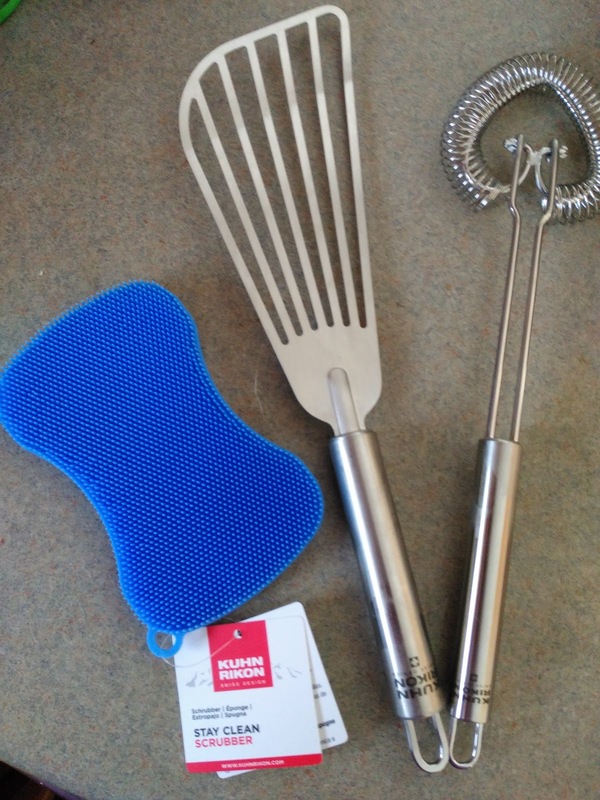 I use it all the time and it is my new go-to spatula for pancakes, eggs and so much more! Say goodbye to your smelly sponge! I am really sick of the nasty sponges I have sitting next to my sink so when I saw this awesome scrubber from Kuhn Rikon, I knew it was the solution to the nasty, dirty sponges! This sponge features over 5,000 silicone bristles clean dishes and multiple surfaces. Purchase all Kuhn Rikon products from the Kuhn Rikon online shop. And if you are looking for new cookware, check out the selection from Frieling! Frieling is proud to offer two different types of cookware lines for any need or preference: premium nonstick cookware by Woll and hybrid cookware by Black Cube. The Black Cube pans have it all! BLACK CUBE features a textured surface for superior browning that is easy to clean. All the benefits of stainless steel and nonstick - no compromise! Purchase Black Cube pans from the Frieling website.